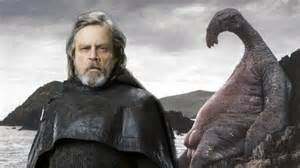 Star Wars TLJ: When Luke Drank Milk Did You Think Gimme, Gimme, Gimme Some? I know some of you are looking at this picture and salivating for good milk. Well today is your lucky day. You can drink better then a Jedi Master. You can drink that milk in MILKSHAKE form. Unlike Luke Skywalker, you can have it in milkshake form.